Here’s a pest you may have heard about, the Spotted Lanternfly (Lycorma delicatula). It is not a fly, but a planthopper. In the Order Hemiptera, Family Fulgoridae. It is actually a much stronger hopper than it is a flyer. Found recently in the US, Spotted Lanternfly has NOT been detected in Ontario yet. The Spotted Lanternfly is a new invasive species to the United States discovered in Pennsylvania in 2014 and unfortunately, has successfully overwintered since then. The Spotted Lanternfly is originally from China and south Asian countries such as India. It was accidentally introduced into South Korea in 2006 and has spread dramatically to become a major agricultural pest, especially for grape production. Spotted Lanternfly eggs overwinter on tree of heaven (Ailanthus altissima) and any smooth bark tree or surface (e.g. patio stones and other hardscaping materials, outdoor furniture). Eggs hatch as nymphs in April and May during the early hours of the day. Once eggs hatch in spring, the waxy coating falls away, leaving parallel lines of hatched egg sacs behind. 1st, 2nd and 3rd instars nymphs have white spotted black bodies. 4th instar nymphs develop black and red mottling under the white spots. Adult lanternflies (above) have grayish forewings with black spots; the hind wings are red and black spotted on the lower portion and grey and black with a bold white stripe on the upper portion. (Photos of adults: Lawrence Barringer, Pennsylvania Department of Agriculture). Adult females are about 25 mm in length; males are about 20 mm. In late September until early winter, adults lay egg sacs, which house up to 30-50 brown seed-like eggs with a shiny, light orange/brown waxy coating. The egg sacs have a smooth, shiny surface. In Pennsylvania, adult Spotted Lanternflies have been found feeding and laying eggs on willow (Salix), maple (Acer), poplar (Populus), sycamore (Platanus), as well as on fruit trees, such as plum, cherry, and peach. In addition, they have been found on grape (Vitis), tulip tree (Liriodendron) and cork-tree (Phellodendron). The Spotted Lanternfly has a wide host range, including grapes, stone fruits, apples, and even pine trees. It also feeds on oak (Quercus), walnut (Juglans), and poplar (Populus). In late summer, adults are attracted to tree of heaven (Ailanthus altissima) to feed and lay their eggs. Spotted Lanternfly has piercing the phloem tissue of foliage and young stems with its specialized sucking mouth parts. The sugary fluid continues to leak out of the feeding site and coats leaves and stems, which can encourage the growth of yellow-white mould. The insects often feed in groups and produce deposits of honeydew, which attract other insects such as wasps, bees and ants. There can be a buildup of honeydew and mould at the based of the tree. The Pennsylvania Department of Agriculture recommends finding and scraping off egg masses from October through May. Double bag them and throw them in the garbage or scrape the eggs directly into a ziploc bag of alcohol or hand sanitizer to kill them. they go on to say that Adults and 2nd-4th instar nymphs appear to be attracted to spearmint oil which could be used in their control. Sticky traps at the base of tree trunks have also been used. A parasitic wasp, Anastatus orientalis was found to parasitize up to 69 percent of spotted lanternfly eggs in China and is candidate biological pest control agent in South Korea. 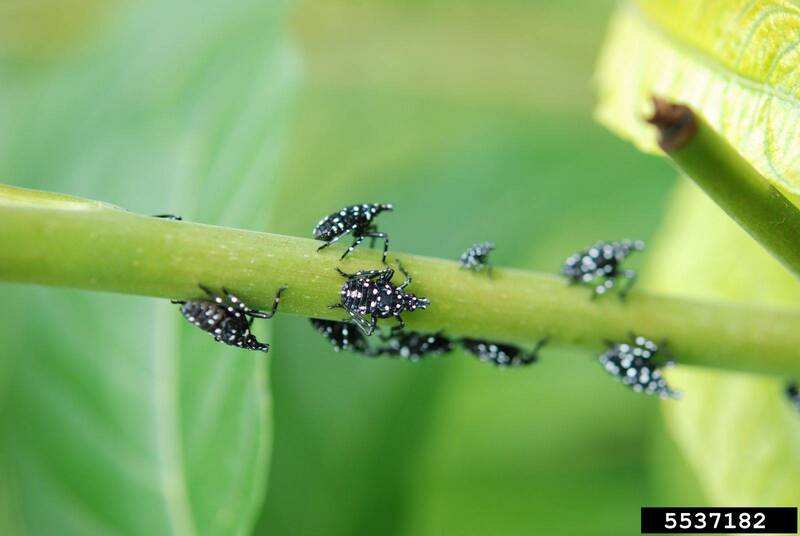 This entry was posted in Insects and tagged invasive species of trees, Jen Llewellyn, Lycorma delicatula, omafra, onnurserycrops, spotted lanternfly. Bookmark the permalink.